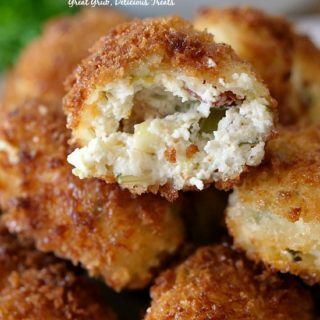 Want a delicious appetizer? 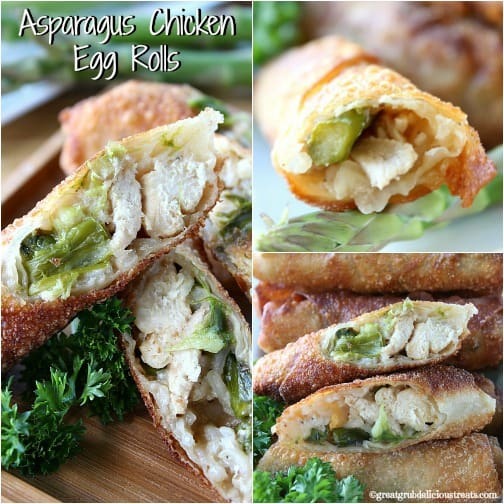 These asparagus chicken egg rolls are just what is needed then. They are amazing and everyone that has tried these loved them! 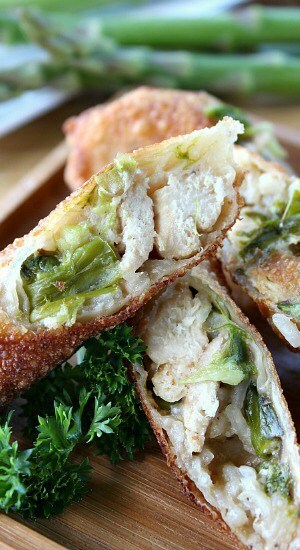 Chicken and asparagus go so well together and what better way then in an egg roll. 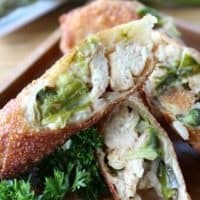 Super easy and delicious, makes these egg rolls AMAZING! 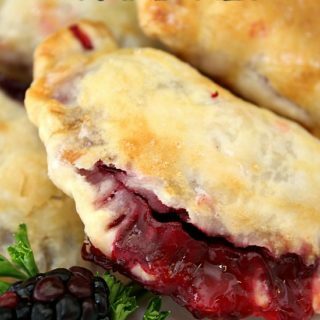 These are super easy and make quite an impression. Basically, cut the chicken into strips and the asparagus into 1 inch pieces. Add to the frying pan with a little oil, cook the chicken first for a few minutes with garlic, salt and pepper and then add in the asparagus. Cook for about 10 minutes, or until the chicken is cooked thoroughly, stirring occasionally. Next, make the sauce. It’s not much but just enough. Whisk together, soy sauce, juice from the pan the chicken is cooking in, and some corn starch. Sprinkle over the chicken and stir. Once that is heated through, add a cup of cooked rice and continue cooking until everything is hot. 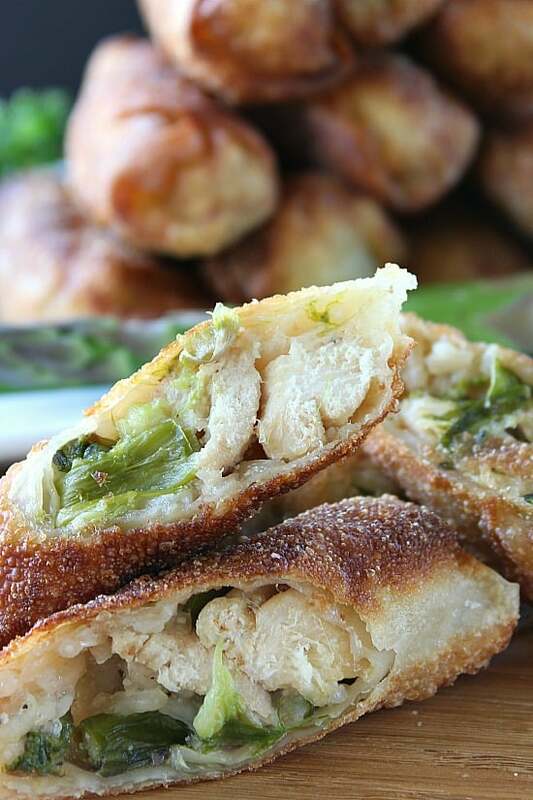 Place chicken and asparagus mixture in the center of each egg roll wrapper. 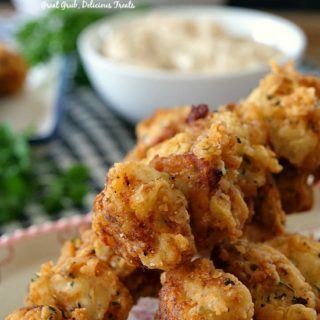 Roll up and fry in hot oil. 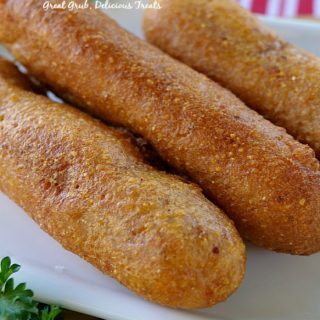 Fry until each egg roll is the desired crispness and color that you want. Then serve these babies warm and enjoy. Sounds pretty easy, doesn’t it? 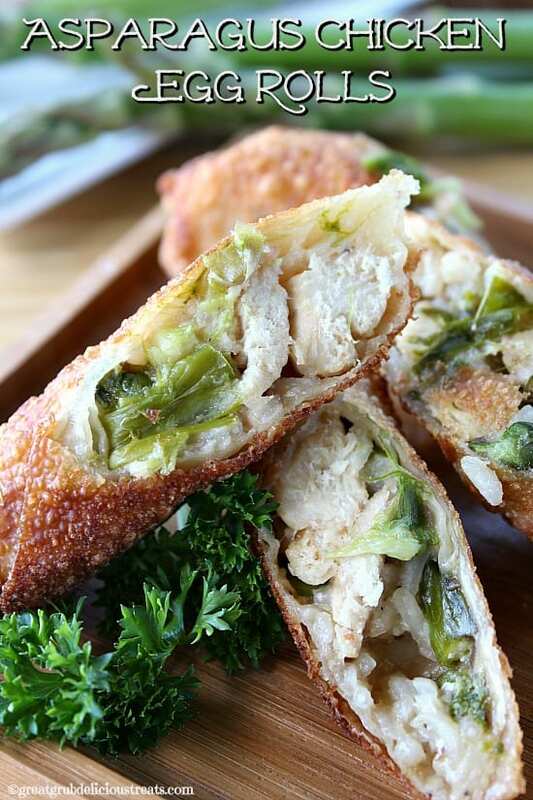 You could be enjoying these asparagus chicken egg rolls in no time. Cut chicken breasts into 1/4 inch strips. You can cut in half so the chicken strips are not so long. Slice asparagus into one inch pieces. Make sure to cut the end off the asparagus. In a large frying pan, heat 2 tablespoons of oil over low heat. Add chicken, garlic, salt and pepper and cook over medium/low heat. After chicken has cooked a bit, add asparagus and stir. 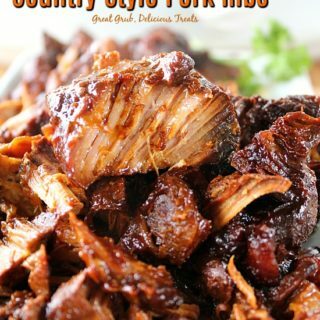 In a small bowl, whisk together soy sauce, juice from pan and corn starch. Pour into pan and stir. Add cooked rice, stir and continue cooking until heated thoroughly. Spoon chicken mixture onto the egg roll wrapper. Roll each egg roll and set aside. Don't forget to moisten the edges of the egg roll wrapper so it will stay closed. In a large frying pan, heat oil over medium heat. 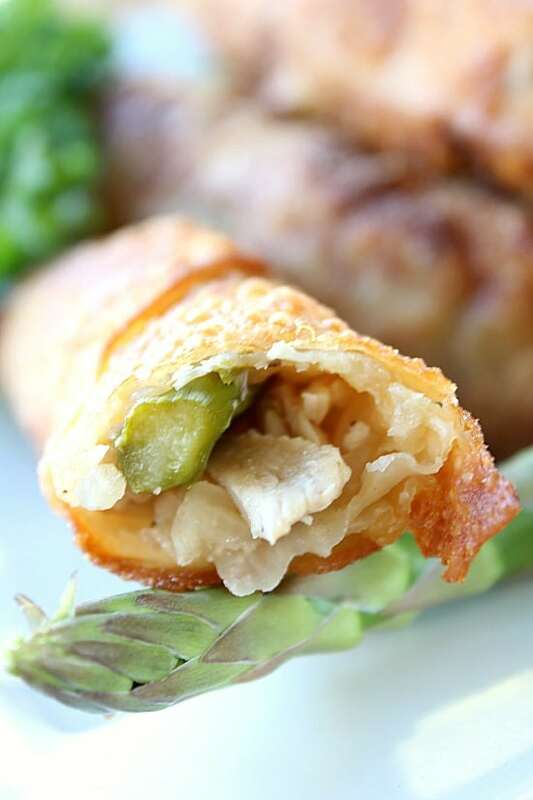 Once heated, carefully add egg rolls and cook on each side until desired color and crispness is obtained. 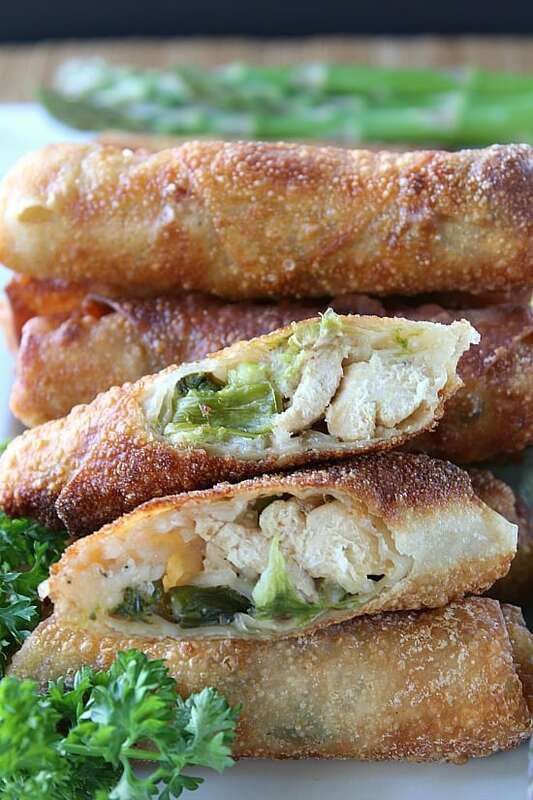 Place each egg roll on a plate lined with paper towels until ready to serve. Transfer to a serving dish and enjoy. 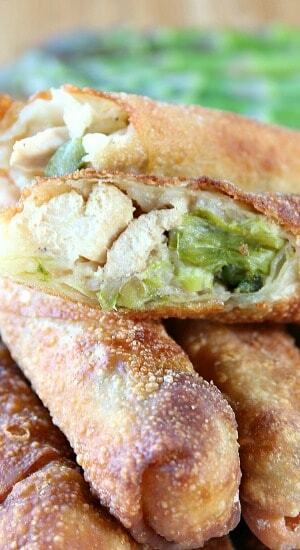 I’m going to try these egg rolls! Pinned this post to Pintrest on my board “The Sandwich Place”. Thanks for the enlarged pic. 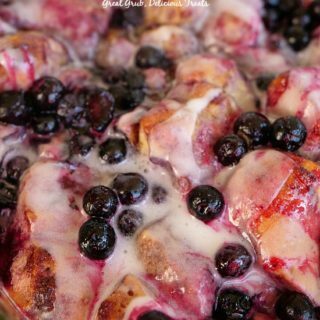 It makes the recipe look so yummy! Wish all the other bloggers would do the same! Hi Nancie, thank you so much for pinning! I’ll check out your sandwich board. I love the enlarged pins too. I try to do that for all my recipes. I hope you enjoy these egg rolls! ?